Siemens have been established in the UK for many years and pride themselves on being at the cutting edge of technology with their design and innovation. Their stunning collection of kitchen appliances offers the perfect balance between the latest technology and eye-catching design, making them a great choice for every lifestyle. Designer Kitchens has been selling Siemens kitchen appliances for many years, alongside their sister brands Neff and Bosch. iQ300 – This range is very competitive whilst still providing many functions and features available on the higher spec appliances. iQ100 – Their entry level range, which offers great value for money together with their Siemens expertise and style. You can co-ordinate between each range, and mix and match ranges to meet your specific needs. There is a wide variety of choices within the Siemens oven range. Siemens single ovens, double ovens, microwaves and steam ovens are all created with both functionality and design in equal amounts. 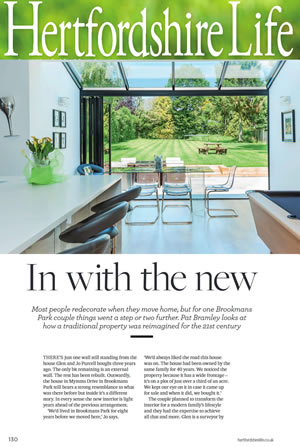 Stylish design and intelligent innovation across the ranges in order to meet the demands of today’s busy lifestyles means that no matter what you’re cooking there is a range of functions and features to help you. Packed with functions such as 3D hot air cooking, hot air eco, self cleaning, keep warm setting and cook control, cooking really has never been easier. And with the iQ700 range (shown here) Siemens have made it even easier with extras such as high resolution display and touch sensitive controls. Siemens steam ovens and microwaves are a further great addition to a new kitchen. Siemens steam ovens retain the flavour and nutrients of foods for a healthier more nutritious cooking experience. Some models offer combination functions, perfect for steaming, roasting or baking. 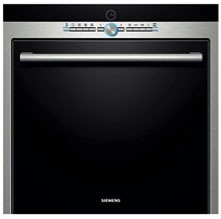 A Siemens Hob is a great choice for your new kitchen, or a great addition to your existing kitchen. Following through with the different iQ levels, Siemens hobs are available in a variety of heat sources, sizes and prices to suit each individual customer. With precise heat control, come with easy to clean, heat resistant glass ceramic surfaces. Their burner design is very flat compared to standard burners. Models with specific wok burners are also available. Offer induction technology for safer, faster and more efficient cooking. 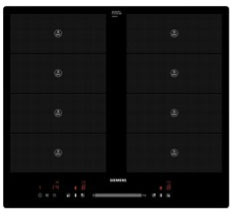 Boasting power boost function for faster heating times and touch controls across each cooking zone, cooking has never been easier. Innovatively designed for greater flexibility, with induction technology across flexible cooking zones meaning you can place your cook ware anywhere on the zone. Full size, integrated and semi integrated, Siemens dishwashers are all A+ energy rated as a minimum, designed beautifully and built for optimum performance. Siemens iQ 100 dishwashers are packed with practical features such as push button controls, LED display, 5 programmes, and can hold 12 place settings. Siemens iQ 300 dishwashers are aesthetically pleasing with a great range of features. They have 6 programmes and can hold 13 place settings. Siemens iQ500 dishwashers combine top class features and technology. They offer 6 programmes and can hold 14 place settings. Siemens iQ700 dishwashers are the most energy efficient of them all and incorporate great technology. They feature all the available programmes and can hold 14 place settings. Features such as varioSpeed, dosageAssist and varioDrawer all offer increased flexibility and efficiency. The iQ700’s Shine and Dry feature uses Zeolith® drying technology to ensure sparkling glassware, crockery and cutlery. Stylish designs and innovative technology make Siemens refrigerators a great choice for your kitchen. Siemens offer a wide range from American-style fridge freezers to wine storage solutions. Keeps fruit and vegetables fresher for longer, and helps to preserve the nutrients in foods. The Siemens coolBox is an additional fridge compartment with a maintained temperature of 1-4ºC. Consisting of two interconnecting shelves, you can pull the lower shelf down when you need it for extra space, or store it under the top shelf when you need a larger space beneath. This allows you to add food to the fridge without increasing the internal temperature, or affecting the food that is already stored in it. Siemens multiAirflow system ensures cool air is distributed evenly throughout each level of the fridge, meaning foods maintain freshness for longer. Siemens washing machines and dryers are packed with innovative designs and technology to keep up with the rest of their appliance range. The autoDry sensor on a Siemens dryer means clothes are dried to perfection every time. Their self cleaning condenser eliminates the need for ever cleaning the condenser. Digital displays are available on some models, showing how long is left in the cycle. All of these features add to the convenience of a Siemens dryer, making washing and drying quicker and easier than ever.